Is your hair dry, dull and lifeless? And you so long for soft, smooth, silky tresses? 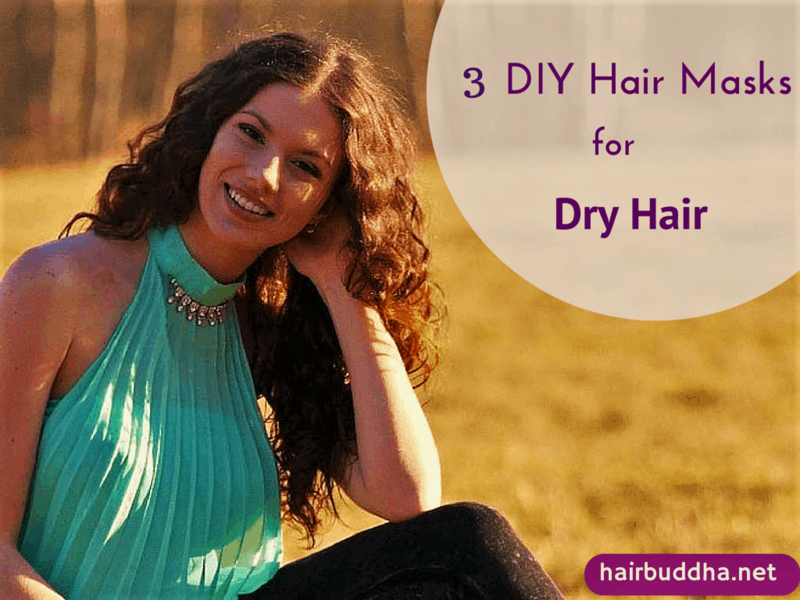 Dry hair occurs when your hair lacks moisture. In healthy conditions, our hair has a moisture content of 10 to 12 per cent. Anything less will cause it to become stiff and brittle. So the simple answer to revive your dry hair is to increase its moisture content. Regular moisturising will improve the hair’s elasticity – so your hair won’t snap and break when combing. Plus, well-hydrated hair feels soft and looks no-less-than-stunning. Next time you feel let down by your dry hair, don’t reach for that hair straighter or head to the parlour to get another chemical treatment. These are just temporary fixes. In the long run, they will make your hair more dry, stiff and lifeless. There are some great natural hair masks that you can make at home. I’ve tried them, and they work great! And most of the ingredients are already in your kitchen. We all deserve a little pampering, and so does your hair. Here are 3 easy ways to give your hair some love.. This hair mask is amazing. It will put plenty of moisture back into stressed tresses. Milk is full of fat to make your hair soft and flexible, as well as lactic acid to help clear away old, dead hair cells that may have accumulated on your hair and caused it become rough and lifeless. And honey? Honey is a natural humectant, which means it attracts and retains moisture. 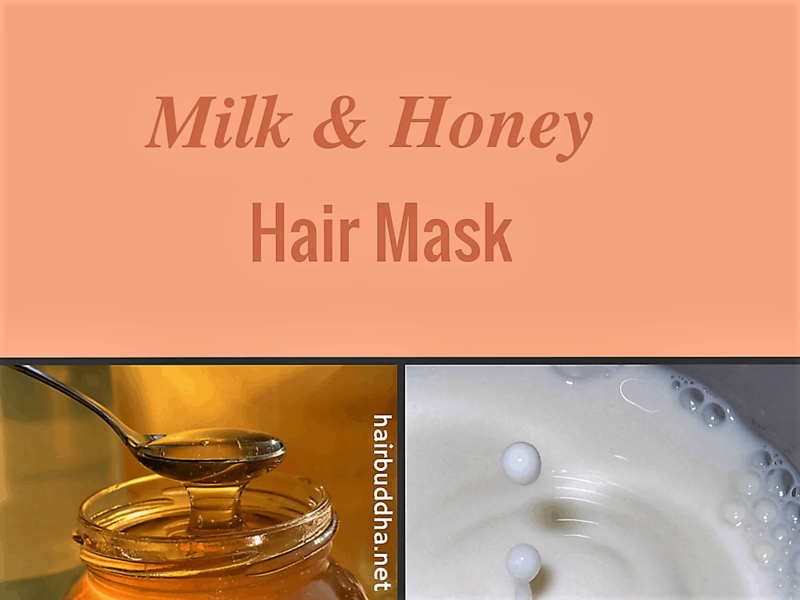 Those of you looking for natural ways to straighten hair, ditch the heat and try out this milk and honey mask. It won’t give you that stiff straighter look (looks artificial to me), using milk and honey on your hair before you wash it causes curls to relax and gives you a smoother, softer and bouncier hair. Just put it in a spray bottle, spray onto your hair and scalp. Put on your shower cap or wrap your head in muslin cloth or a towel. Leave this on for 20-30 minutes, then rinse off thoroughly. Next wash the hair with one of the natural hair cleansers and dry naturally. Enjoy your soft, silky hair! If you are using cream, simply mix cream with honey and give it a good stir. Apply on your hair and scalp using your fingers (you can also use an applicator bottle). Then follow the above instruction. *Use raw honey if you can find, as it contains more nutrients. Note: Honey has a mild bleaching effect over time, so if you have darker hair I suggest using dark molasses in this recipe. Or you can skip honey altogether, milk itself is a great moisturiser and natural hair straightener. 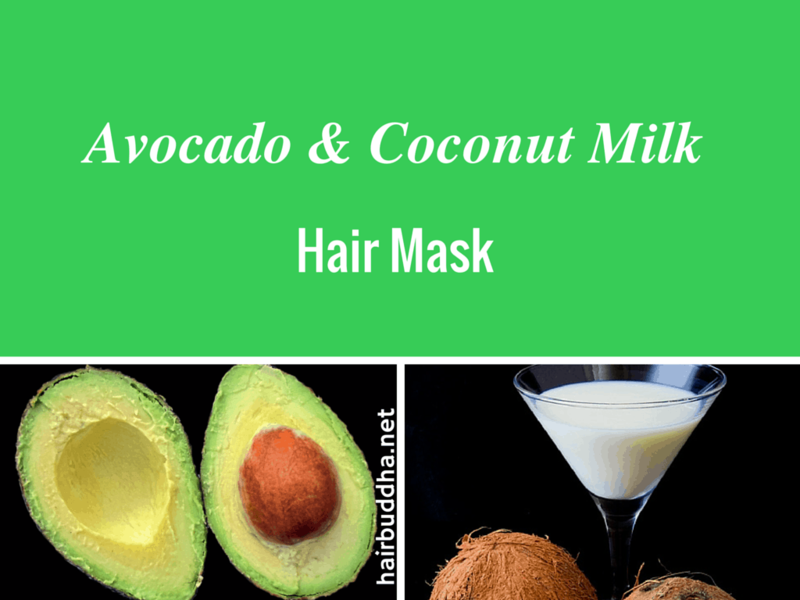 Made with fat rich avocados and hair moisturising coconut milk, this mask will bring new life to your dry, dull hair. The amazing fats in the avocados coat your hair and form a protective barrier, keeping your hair well moisturised, soft and flexible. Avocados also have high protein content (they contain more protein than any other fruits) which impart strength and shine to your hair. Coconut milk is very hydrating, and it works great as a hair detangler too! Toss in some olive oil and honey and you have a real treat for your hair. Mash the avocado, then put it in a blender, add the oil, and coconut milk, and blend until smooth. Start with dry or damp hair. 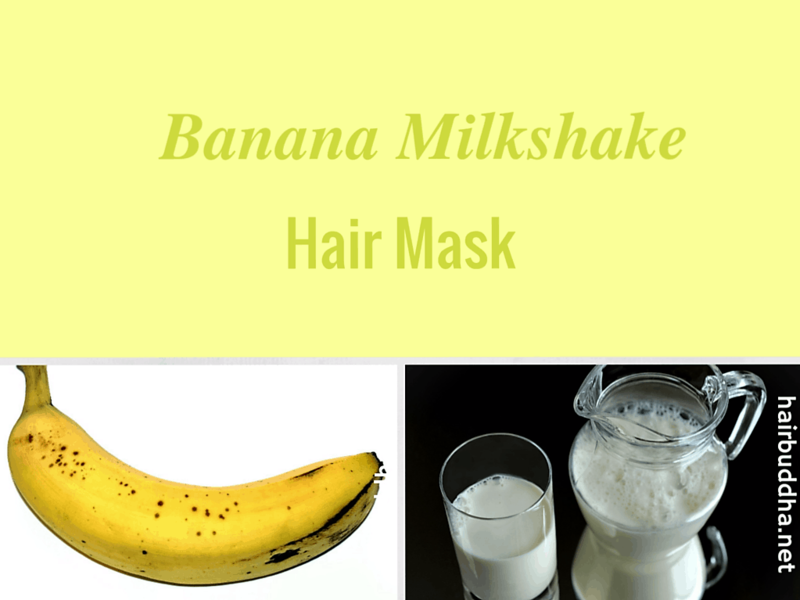 Apply this mask to your hair, making sure it’s saturating your hair and caressing your scalp. Put on your shower cap or wrap your head in muslin cloth or a towel. Leave this on for 20-30 minutes, then rinse off thoroughly. Next wash the hair with one of the natural hair cleansers and dry naturally. And don’t be surprised when your hair is super soft and shiny. This is a superb mask for dry and damaged hair. High in vitamins, and minerals, bananas have amazing moistursing and shine-enhancing power. Couple this with milk and honey and you have a match made in heaven. This mask will make your hair silky, smooth, and extra shiny. And if you are after the natural straightening effect, milk and banana duo will help you a great deal. Put all the ingredients in a blender and blend until smooth. Its consistency should be runny, but still thick enough to stay on your hair. Very ripe bananas work best in this recipe, make sure you blend the mixture until it’s really smooth. Leave no chunks. As it’s really hard to wash out banana chunks. A better idea is to use baby food banana puree and you don’t have to worry at all. *If you prefer not to use milk, you can use coconut milk instead, which is equally moisturising and hair softening. Start with dry or damp hair. Apply the mask to your scalp and hair (you can use an applicator bottle for this). Put on your shower cap or wrap your head in muslin cloth or a towel. Leave this on for 20-30 minutes, then rinse off thoroughly. Next wash the hair with one of the natural hair cleansers and dry naturally. You may or may not need to condition your hair after using these hair masks, just see how your hair feels after you wash it. Have you tried any of these masks?How did it work for you? Share below! I have been looking for a home made hair mask remedy for Dry,frizzy and coarse damaged hair (split ends on scalp).Heard about a combo of egg white,curds and banana? Does this work? If so, please suggest the right quantity of these ingredients. Use 1 egg yolk, 1 banana, 1/2 cup yogurt/curd and 1 tablespoon olive oil. Thank you Minaz..will try it. Thank you so much Swathi..Did you use it to treat split ends? homemade ree-shi shampoo and add hair softening herbs such as methi, licorice (jestamadh/mulethi) or marshmallow when soaking/making the shampoo. You can also try a mixture of 1 tsp coconut milk and 2 tsp castile soap to shampoo your hair. If you are looking to buy thenKhadi shikakai and honey shampoo is good. Hi 🙂 I stumbled upon your blog some time ago and whenever I’m in need for some hair advice I always visit your blog for answers. Both me and my hair thanks you! Although seeing results takes time I still see my hair getting happier. Keep up the good work, you are appreciated! Hi Sara, I am glad you are enjoying the site. Thanks for your kind words. I oil my hair before shower, can i do this on oiled hair? Or will it just be too much? You can do any of them on oiled hair. I have tried milk and honey pack and it made my hair very smooth and soft.